Your greatest resource is your time. Why not use it efficiently? 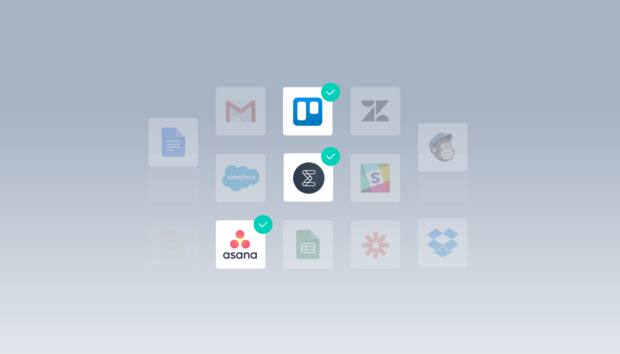 We’ve partnered up with Zapier so you can connect your Enalyzer account with more than 750 apps and automize all your work processes. You can now save time and worry about making better decisions. You can get notified instantly once someone answers your survey, send automatic surveys to paying customers or add new survey respondents to your CRM. Zapier is a web automation tool that moves data between applications by using Triggers and Actions. The combination of a Trigger and an Action creates a workflow, called Zaps. Through these Zaps, Zapier watches your apps for new data and kicks off Actions based on the Triggers that you set. Enalyzer makes collecting feedback simple, while Zapier ensures the feedback can quickly be put to use. Integrate Enalyzer with Slack, Google Sheets, Gmail, and the like to receive your customer’s feedback straight away. This allows you to react faster to critical customers. Engaging your audience is important and you can do this in several ways, such as feedback surveys and webinars. Instead of doing all this tedious work manually, connect Enalyzer with MailChimp or another email service app via Zapier and let the software handle it. Now you can use your time to understand your subscribers and creating relevant content for them. Or go ahead and use the Enalyzer-GoToWebinar integration to automatically add your respondents as webinar registrants. Online surveys can be used for more than research. By integrating Enalyzer with project management apps like Trello and Asana, you can optimize collaboration within and across departments. For example, set up a survey where you can insert project details, such as project type, deadline, budget and employee responsible, into your Enalyzer survey and Zapier can add this as a card on Trello or a task in Asana. Whether you just made a sale on Shopify or you’ve added a new contact to your Google Sheets database, Zapier integrations make follow-up surveys easier and faster. While data is being transferred, you can spend your time analyzing your data as it comes in – all with Enalyzer’s real-time updated reports. How to automate Enalyzer with Zapier?